Every company has its own sales plan. It starts at the beginning of the year, and carries through the whole 12 months. Most companies then break that numbers down into quarterly sales target. Most of the time, a company will have 4 quarters throughout the year. 1) Often called the 'kick-off' meeting, took place early of the year. During a sales meeting, Sales Managers are going to present how their team had performed within that time period. All the bells and whistles will sound off during this time. But the 'real' thrill, actually, took place before the meeting. 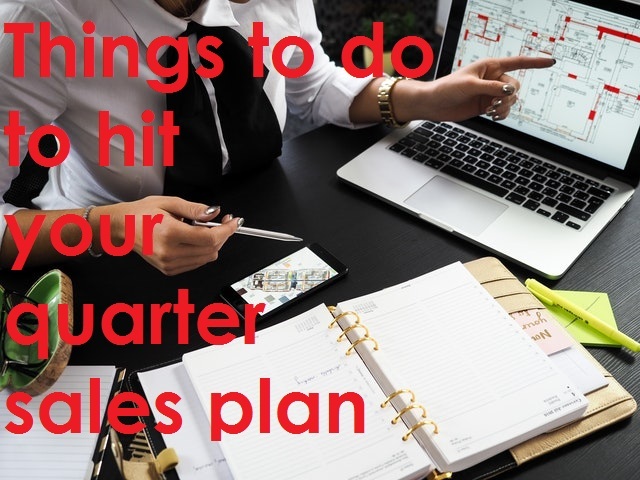 It's before the reps make their way to the designated location for the meeting, and it's all about their performance - whether they hit or miss their quarterly sales plan. Consistency is sales is, of course, most ideal but sometimes, not every rep can achieve that. For high achievers, this article might tell you a thing or two about how you 'actually' did it. See if it resonates with you. For the rest, who have the will to make it in the next round, the article provides you with action plan that you can implement to hit the numbers. Give it a quick read - 8 Things Salespeople Can Do Right Now To Meet Sales Quarter Plan - then start mapping out your strategy based on that.